On Hope Island near Virginia Beach there is a large inn. 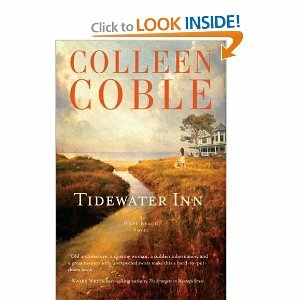 The name of the inn is TIDEWATER INN. COLLEEN COBLE shares the details of Tidewater Inn's decorative beauty immediately. In this way I knew all that would happen for good or bad in the novel would tie back to this property. I was not surprised to learn the main character, Libby Holladay, worked as a historical restorer of homes. Libby does not really work because she loves restoring and researching the past of these aged buildings. It is her dream job. The house was definitely in the Federal style, as she'd been told. Palladian windows flanked a centered door, or rather the opening for a door...She could almost see the original occupants in this place."